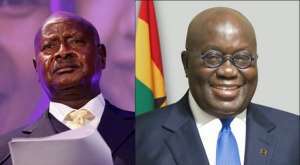 It's a piece of interesting news to read: "Ugandan Ask Nana Addo To Replace Dictator Museveni." The following news caught my attention this morning on ModernGhana news site. The plea was made by one Hillary Taylor, a Ugandan student, pursuing masters in International Relations at the Harvard University Kennedy Institute. It's a great honour to the Nana Akufo Addo for Hillary Taylor to make such a request but Miss Taylor doesn't know that such task alone is tougher than the whole affairs pertaining to Ghana in the hands of Nana Akufo Addo. Despite slavery, colonial brutality, Apartheid, and medical crises, including Aids and Ebola, it is obvious that about sixty-five percent of Ghanaians don't have much knowledge about the role external forces had played and still playing to retard the growth of Africa. Average Ghanaians, from morning till evening argue and fight over two political parties, NDC and NPP, without a slight knowledge that our leaders alone aren't responsible for our political woes, economic burden and unrest in the country. I want to make it clear to Hillary Taylor and fellow Ghanaians that the US government preaches against dictatorship, forcing every African government to follow the 'Almighty Democracy,' yet the same US government supports corrupt dictatorship governments in Africa. Why has the US government tolerated the Ugandan leader for all these years but went wild and hostile against Robert Mugabe, the ex-Zimbabwean leader? Mugabe refused to associate himself with the British and the US governments after he discovered that entire Zimbabwe had been deliberately infected with Aids before independence. That bitterness and hate embedded in Mugabe against the West and the US governments forced Britain and America to stand behind Emmerson Mnangagwa to unseat Mugabe, but Museveni remains untouched and undisturbed, Why? Even though Uganda experienced the same deliberate spread of Aids infection and a host of cancerous diseases such as Kaposi's sarcoma, nodding disease, and Burkitt's lymphoma, Museveni continues to maintain a friendly relation with the British and the US governments. In fact, the entire Ugandan citizens were used for various experiments under the supervision of the World Health Organization and the Centers for Disease Control. We (Joel Savage, Johan Van Dongen, and Dr. Wolff Geisler) have published some of these articles on ModernGhana and our health blog under the radar. Museveni has never criticized or held the British and American governments responsible for such horrendous crimes. Africans, Ghanaians, you must, therefore, understand the reason, the US government keeps preaching about democracy but still supports dictatorship government in Uganda. I am just a common journalist, never had the opportunity even to step at the front door of any university, yet Europe, Scientist Johan Van Dongen, and Dr. Wolff Geisler, have educated me about foreign affairs, in such a way that I have ample knowledge about clandestine crimes the British and the US governments commit in Africa, yet Hillary Taylor, studying at Havard University has no idea, else she wouldn't have made that request. Even though on many occasions I have criticized and hit against past and present African leaders, including Nana Akufo Addo, John Jerry Rawlings, John Mahama, etc, I will still plead, for Ghanaians or Africans to have a little patience for any African leader. There is no African leader who is stupid. All of them are aware of the roles foreign governments play in destabilizing Africa's economy, and also about the deliberately hitting the continent with Aids and Ebola but they still like to remain silent, hoping for a change because they want to remain friends with them. Because of the same cordial relationship, African leaders want to maintain with the US government, has enabled them to accept funds from America to finance Aids and Ebola projects in Africa, instead of rejecting them. However, Africans need to ask ourselves: what comes next after slavery, colonial brutality, Apartheid, Aids, and Ebola? I will never forget what the former Sierra Leone ambassador to Belgium, Hon Ibrahim Sorie, told me when I visited him with the Belgian branch of the APC party members at his residence in Brussels. When I told him about the Ebola research by scientist Johan Van Dongen and Dr. Wolff Geisler, pointing fingers at the US government as the perpetrator, he said: "Instead of witch hunting we prefer peace." But how long will Africans sit and watch to be slaughtered like cows and pigs by a senseless government that preaches virtue and practices vice? Those who like to bully people continue bullying because they enjoy seeing their victims crying for mercy. All comes to an end the day the victim who thinks enough is enough strikes back.